Cricket Australia, the ACT Government and Cricket ACT have this morning announced that Manuka Oval will host an Australia v Sri Lanka Test match in the 2018-19 cricket season, and ACT Chief Minister Andrew Barr says that as a result of this big news, major redevelopment of the ground is on hold for now. 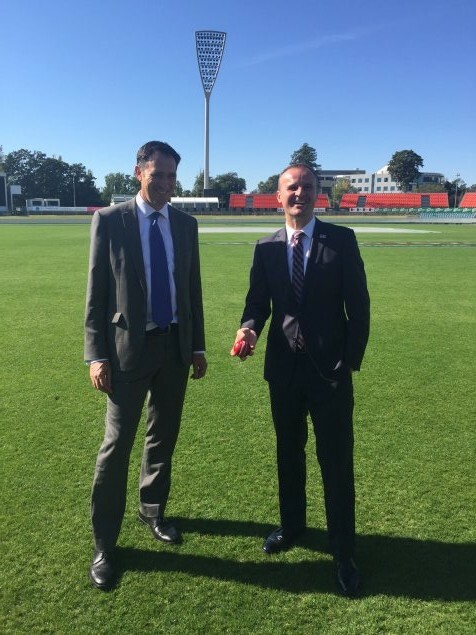 Cricket Australia Chief Executive Officer, James Sutherland joined ACT Chief Minister, Andrew Barr MLA and Cricket ACT Chief Executive Officer Cameron French at Manuka Oval, following the announcement of the 2016-17 Australian men’s international schedule earlier in the day. Included in that announcement was news that New Zealand will be playing a One Day International match against Australia at Manuka Oval for the first time during the 2016-17 season Chappell-Hadley series. Mr Barr said that over the past couple of summers, the ground had hosted men’s and women’s One Day International games and the Cricket World Cup in addition to the ever-popular Prime Minister’s XI. “All of these games have been supported by big and enthusiastic crowds, which has lead Cricket Australia to making this decision,” he said. He added that aside from improvements within Manuka Oval itself, such as to media facilities, there would now be no redevelopment such as the unsolicited Manuka Green proposal from GWS Giants and Grocon until after the 2018-19 Test match as the ground could not be a construction site during such an important fixture. The ACT Government had invested significantly in Manuka Oval in recent years to ensure that the venue was well placed to host Test match cricket. Mr Sutherland said the announcement recognised the continued growth of the sport not only in the ACT but the wider region, and was a testament to the effort being placed on participation in the Territory with more than 32,000 playing cricket last season. “Part of our charter is to showcase the game to as many cricket fans around the nation to encourage growth, and with more than one million people living in the ACT and Southern NSW region, we believe there is a great advantage in Canberra hosting a Test Match and that’s one of the reasons that we will host a Test match in Canberra in 2018-19,” he said. “Canberra is a key regional hub for cricket in the ACT and Southern NSW region, and the partnership between CA, Cricket ACT and Cricket NSW with the ACT Government has been outstanding and we hope it continues to flourish,” concluded Mr Sutherland. Don’t think the unsolicited bid process will stop. This will continue and the bulldozers will be ready to roll the minute the test match ends. KEEP THE PRESSURE ON BARR TO STOP IT! You never let up DungFungu, the constant Govt bashing is tiresome. It’s just ALP bashing on your part. Victoria reportedly paid in excess of $2.5 million to host a rugby league State of Origin fixture at the MCG last year and now cricket could be heading towards a similar scenario where a Test match could potentially go to auction and be awarded to the highest bidder. So Mr Barr, how much is this going to cost ratepayers? Andrew Barr is suggesting up to $10 million will be spent on Manuka Oval to enable this event and others like it. There has been nothing reported about how much we are to pay for the “privelege” of hosting the game/s either. I hope it is not another $700K a game like we pay GWS. Our chief minister is also suggesting we should be “importing” soccer games from NZ. When will this all end?